Believe it or not, there’s now a way to enjoy fried foods without the guilt thanks to Power Air Fryer XL™ from Tristar Products. Power Air Fryer XL™ effortlessly delivers a crispy, fried meal without the added fat and calories. I have been hearing all the buzz about the Air Fryer and could not wait to get my hands on one for myself! I am only eating healthy recipes right now and this sounded like something I needed in my life. So when my Power Air Fryer XL™ arrived it was like Christmas! I was so excited! I received the Power Air Fryer XL™ for review for this post. Tell me more about the Power Air Fryer XL™! Meals are cooked in a whirlwind of superheated air that reaches up to 400 degrees. With the help of Power Air Fryer XL™’s rapid air technology, you’ll no longer have to sacrifice taste or deal with grease splatters and oil in order to enjoy your favorite foods. Tell me how to make the perfect pork chops in a the Power Air Fryer XL™! Step 1: Remove the pork chops from the packaging and place on the cutting board. Step 2: Sprinkle with pepper and salt to your preference. Then season is Season It All Seasoning. Step 3: Place 4 boneless pork chops in the Power Air Fryer XL™. Step 4: Close the handle all the way and then select the chicken option. If you want to do it manually you will choose 20 minutes at 360 degrees. I did not shake or flip at all. I turned it on and let it cook. Once the Power Air Fryer XL™peeps you will know your perfect pork chops are ready! Step 5: Remove, plate, add some veggies, and enjoy! So easy and so delicious! They are juicy and yet crispy in the right places. The Power Air Fryer XL™ is a life saver! No need to add oil or extra fat to your perfectly cooked or fried products. This helps reduce the calories in your food. And you don’t have to heat up the house by using your oven or stove! This tiny machine has the power of the oven in a little package! The Power Air Fryer XL™ comes with a little recipe book and instruction manual that is very helpful for getting started with your Power Air Fryer XL™. Here are some of the preset features for this model. I have the 3.4 quart Air Fryer XL. 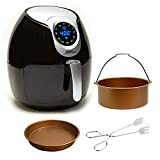 Tell me how to save money on the Power Air Fryer XL™! They offer the 3.4 quart ($119.97) and 5.3 quart ($149.97) units. They can be purchased through powerairfryer.com in either red or black. You can also find them in retail stores like Bed Bath & Beyond, Kohls and Target. I know you want your own Power Air Fryer XL™ right now so I am excited to share this promo code for an Air Fryer with you! 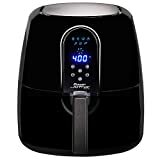 Promo code for 10% off Power Air Fryer XL™: PAF10 Or visit Amazon here.